With the holidays upon us, driving becomes increasingly impossible as folks flock to the malls to get their shopping done – around here generally in giant SUVs and without the need for the basic courtesy we give our fellow man in the parking lot during the rest of the year. Fortunately, no matter where you are, thanks to our consumer culture, you probably have to opportunity to shop in the exact same stores and buy the exact same things that everyone else does once you’ve played parking roulette. Likewise, I suspect that doing some of that Christmas/holiday shopping locally and regionally seriously appeals, both for the potential original gifts and the limited mall time. If you, like me, are currently fighting the ills of a nasty cold and dread the notion of fighting the malls and the traffic, here’s a list of places to go or to order online that really will make your shopping day brighter. Bathos: Easily one of my favorite places in the whole world, Bathos in downtown Franklin, Tenn. Offers handmade soaps, bath fizzies (“hullaballoos”) and skin care that top most of the national brands. Treat yourself to the lavender-scented Bathing Not Drowning fizzies – or my favorite Hoo Hing Spice Balls. The marmalade soap smells like heaven, and scents your bathroom, while the tough guy in your life will love the Tar Bar or the Daily Grind coffee-based soap. The Franklin Antique Mall (a.k.a. “The Icehouse”): My favorite source for antique and vintage, both knick-knacks and serious pieces of furniture. There are several great antique malls nearby on Second Ave. and for new home stuff you won’t find elsewhere, stop in P.D.’s in the train car across the street. Potent Potables: The area has really started producing some excellent spirits of late. Get your spiced rum, truly excellent, juniper heavy gin, and vanilla vodka from Corsair Artisan Distilleries, pick up some better-than-Irish Cream Whisper Creek Tennessee Sipping Cream created by Speakeasy Spirits and outstanding Collier & McKeel Whiskey – Mike Williams amazing product also distilled right here. Of course, around here, you’ve also got Jack Daniel’s, George Dickel, and a host of really good Kentucky bourbons – and at most of these places, if you live nearby, let me recommend taking tours as part of your holiday festivities. I particularly love the one at Woodford Reserve. While you’re buying, pick up a bottle of Heroes Vodka – they’re not only a Tennessee company, but they support veterans charities right here – like Operation Stand Down – with a significant portion of their profits. Jewelry You Want Under the Tree: There are plenty subsections to this one, not all in the Nashville area. Among your options are fine jewelry, really nice fashion jewelry, and some more unusual options from some of my geek girl connections that are nevertheless splendid and appropriate. Margaret Ellis: I’ve always coveted her work, in hammered silver and 22 kt. gold. Designing from a studio in Cummins Station in Nashville, she really helped define the city’s artisan jewelry making scene for me when I started writing about fashion here, and I remain a major fan. If you have someone to impress on your gift list, start here. She’s deservedly one of the most popular Nashville jewelers, and she has very nice men’s pieces as well as women’s. Judith Bright: I never leave home without her work on somewhere, it seems. Her Rock Star pieces number among my favorites. A former music industry girl who spread her wings, studied jewelry making in Florence, and brought a Renaissance aesthetic to the contemporary world, Judith is something special. She now has outlets in Atlanta and Los Angeles too, but her online shop is very accessible. As with Ellis, buy her pieces knowing they’ll last forever and remain classic. Cindy David: Synonymous with creative fashion jewelry with flair, her work is affordable and supremely on-trend. She works with quality semi-precious stones, and when you buy from her, you get a well-made, exceptionally wearable piece that you’ll reuse in a million ways. The Crafty Celts: I’ve known these South Carolina-based artisans seemingly forever, and their work only gets more gorgeous. Based on historic designs and artifacts from all over Europe, the work is high-end, the pieces are exquisite, and you won’t find anything else like it. My husband gave me one of their beautiful bronze torcs (necklets) right after we started dating, and I wear it constantly – no one else has anything like it. Buy here for guys and girls alike, and you’ve scored a big ol’ win for the folks on your list who are history minded, or who are huge fans of Game of Thrones, Spartacus and Rome. Followers of Fashion: Around here, only a fool fails to mention the excellent ties of Mr. Otis James and the oh-so-desirable bags of Emil Erwin – leather goods are pretty hot when they come from the designs of Phillip Nappi at his Peter Nappi boutique as well, and there aren’t a lot of local shoe designers around here. To round out the list of things you’ve probably already seen in Garden & Gun, but still should explore, check out Imogene + Willie, the 12South boutique that brings you custom, handmade jeans you’ll wear for life. Vintage Finds: With those out of the way, let me throw in a few less obvious choices. First, the vintage world is a brilliant place to be. In East Nashville, Old Made Good (OMG) is a fantastic locale for reviving the old school into new style. In Murfreesboro, Sugaree’s Boutique, owned by my fashion-forward friend Staci Higdon, carries a lush selection of 1920s to 1990s vintage, as well as plenty of current looks – one of the few places that does both jobs well. If you make your way to Huntsville, Alabama, the Lowe Mill Arts and Entertainment Center has a plethora of vintage stores set inside an old factory – super cool. Plus, all the artists’ workshops in the same building give you plenty of holiday options. Designer Originals: Start with the bespoke – if you’re planning your wedding right now, or have a formal event to attend, Olia Zavozina, who made my wedding dress and does custom bespoke suits for the Tennessee Titans is a superpower from her atelier in Edgehill Village. Guys, if you’ve got debonair tastes and have a good sized budget, the bespoke world beckons to you – former Hugo Boss and Calvin Klein head honcho Barry Wishnow’s bespoke Bash line is one of the most exceptional things I’ve seen this year – yes, you can channel Cary Grant. From bespoke, move to designer originals – I’ve mentioned Alabama Chanin before, but especially since she’s got a pop-up boutique this month at Leiper’s Fork’s The Copper Fox (another great source, if you’re buying art) as well as her Florence, Alabama atelier, for my money she’s the most creative creature in the refined world of Southern fashion. If your budget doesn’t allow for her garments, her books and kits will let you create your own. (And check out my long-form piece on her in this month’s Nashville Arts magazine). Speaking of DIY, if you aren’t familiar with Chanin’s sometime textile and fiber art collaborator Anna Maria Horner, this is a good time to learn – her kits are perfect for the crafter in your life. It may sound odd, but I’ve found a plethora of marvelous hand-made textile options at The Franklin Farmers’ Market lately. The winter market is up and running, and it’s proven a great source for original knitted and crocheted pieces, and some original stuff made from recycled and repurposed sweaters – including really wonderful hats scarves and shawls. Of course, there are plenty of culinary options, from jam and pastries to pies from Geraldine’s and Papa C at the market as well. More on that below. If you’re looking for beauty, fragrance, skin care and the like, here in Nashville, we have the wonderful Woo Skincare and Cosmetics, which also has an Atlanta location. Exclusively carrying a number of premium lines, this is a fabulous gem of a store for the beauty addict, male or female. Nashville and Chattanooga both offer the Cosmetic Market, outlets for Therapy Systems entrepreneur Linda Roberts. They carry plenty of popular lines, offer serious spa treatments, and carry the Therapy Systems skin care line, which for my money is as good or better than larger lines that are three times as expensive. At Home: Housewares are sometimes tough, but I think there are amazing finds to be had. Lodge Cast Iron, out of Chattanooga, is a must-have for any home cook. If you can’t cook in cast iron, you must not have Southern roots – my dad, a master of the cast iron cookery, gives me a new piece almost every year. It gets used. 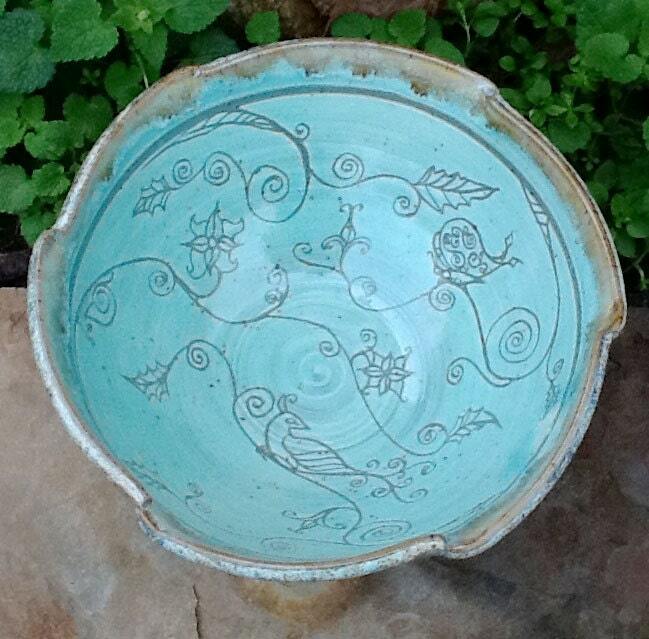 Pitchers and bowls with a historic sensibility from Tuscaloosa, AL.-based Kerry Tyson Kennedy’s Firehorse Pottery fill my china cabinet – she has an Etsy store, so they can fill yours too. Georgia’s Uncorked Glass Company is also on my list – repurposing wine bottles into lovely glassware. I have a set of the green, and we use them constantly. And speaking of repurposing wine bottles, I’m really hooked on a new Tennessee company producing 100% soy candles in repurposed wine bottles as well. Intoxicating Aromas sells at the Franklin Farmers’ Market and at The Copper Fox mentioned above, but doesn’t yet seem to have a web site – contact them ($15-$20) via intoxicatingaromasATyahoo.com – the “home and hearth” scent is perfect for Christmas. 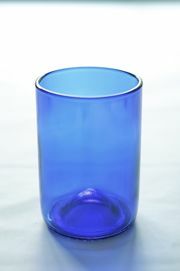 Cobalt blue glasses from Uncorked Glass Company, $44 for a set of 4. My friend Michael Schuerer in Decatur, AL. mentioned another really fantastic, if pricey, home option to me – the incredible functinal steel sculptures at Fire Pit Art are something you have to see. As popular as the outdoor metal firepit has become ( we have one, and so do most of our friends) this company takes that up a whole level, and introduces the firepit as incomparable art work. Tennessee based Fire Pit Art redefines the fire pit; these start at about $1,000 for a 36 inch fire pit. And, Of Course, The Food: Because it ain’t Christmas, or Hannukah, or Solstice, or Kwaanza or New Year’s, or Saturnalia, or Festivus or whatever your family celebrates this month without food. Ah, where to begin? Well, as someone with a whole lot of family in the great state of Virginia, I’ll tell you Virginia peanuts from the area around Southhampton County make for some fine gift giving. 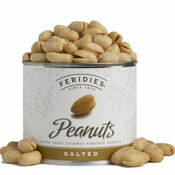 Feridies is the go-to source for my family going back years, with Hubs coming in not far behind. I like the spicy Cajun, but the plain salted is just fine. We eat these things like candy – except fortuitously they have food value. I few days ago, I wrote about Kristina Mansoor, Nashville cupcake and cake baker extraordinaire. I reiterate the need to buy her cupcakes. If you happen to be in the Atlanta area, call Barbara Reed of Bianca’s Designs for your holiday cakes. I have eaten plenty of her baked goods, and thankfully, I don’t live near her, or I’d be fat and have no teeth because of all the sugar (she also teaches cake decorating courses). If you’re ordering sweets, I also suggest Dozen: A Nashville Sweet Shop for excellent cookies made of organic ingredients. Her chocolate chip cookie are delish, although my addiction is the peanut butter ones (I can be bribed with these). Bang Candy Company produces some of the world’s best artisan marshmallows, and owner Sarah Souther also does a bang up job on truly unusual simple syrups that need to be paired with Prosecco before your next holiday party. I might need some now – where’s my bottle of rosemary ginger? Of course, Olive & Sinclair chocolate is really becoming a big deal. I favor the salt and pepper variety, because sweet and salty is good. I’ve mentioned Miss Daisy King before – if you’re in Nashville, drop by and see her at the Grassland Market (2176 Hillsboro Road in Franklin) and pick up some of her amazing sides or desserts to take home for your holiday indulging. Take home a cookbook or two as well. Hint – go for her pound cake. And of course, remember you can also buy Allan Benton’s bacon there. If you’re in East Nashville, drop by and see Kathleen Cotter at the Bloomy Rind for handmade cheeses and, in the same space, the guys at Porter Road Butcher – artisan does taste better than mass produced. Lastly, sadly only available on Saturdays at the Franklin Farmers’ Market so far, Ellie’s Old Fashioned Doughnuts are a revelation of sweets. Save up all your points or calories or carbs for them. Buy a big bag to take home and reheat the next morning (20 seconds in the microwave makes a doughnut perfect). Eat one as you leave while sugar dribbles down your chin. I don’t obsess over much food, but these are that good. I could go on and on, but we’ll save more for other posts as we approach the holiday season. Meanwhile, don’t forget to also shop your locally owned businesses and boutiques – because having a gift that really is one of a kind is truly worth it. And also because supporting local artisans and small businesses just makes sense, and makes for a better holiday season for everyone in your community.